Graduates of Assam with working knowledge of computer can apply for IIT Guwahati for Recruitment of Junior Assistant. Indian Institute of Technology Guwahati (IIT Guwahati) invites online applications from eligible Indian Nationals for appointment to the posts mentioned below. There are total 20 nos vacancy for the Junior Assistant posts at IIT Guwahati. These posts are advertised for graduates with computer knowledge of office applications. Interested candidates should apply online on the official website. No other means/mode of application will be accepted. For the IIT Guwahati for Recruitment 2017 for Junior Assistant a Bachelor’s Degree with working knowledge of computer office applications is acceptable.. Maximum 27 years as on last date for receipt of application form (Age relaxation for SC/ST/OBC/PwD/Ex-Serviceman will be as per GOI rules). Candidates will have to make the payment of application fees through the online mode as under: Rs. 300/- (for General/ OBC candidates) and Rs. 150/-(for SC/ST/PwD candidates). For more computer job in Assam please check our other articles. 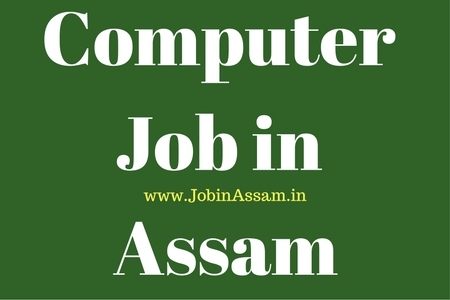 There are various jobs available for computer operator in the govt offices of Assam.